Helpful friendly staff, English spoken. 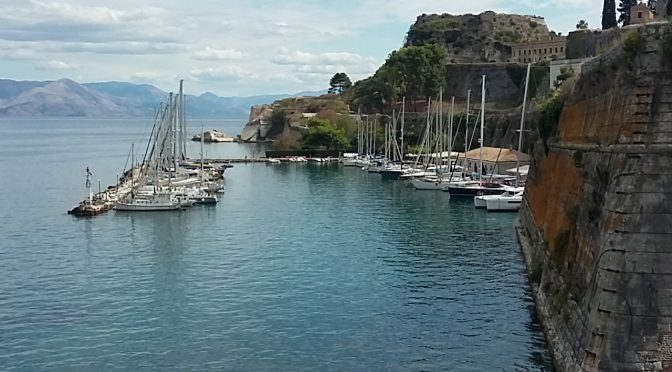 Small yacht marina in the shadow of the old fortress in Corfu Town. Quiet location, very picturesque. Suffers some ‘slop’ working it’s way in but only uncomfortable. Laid moorings. If on the outer wall go bows too to avoid ballast extending from the wall. We stayed in settled weather. Wall is only about 1 to 2 metre high and not sure how sheltered the location would be in strong northerlies. Having said that there are a number of yachts here which seem pretty permenant. Good WiFi. Fuel available. Electricity and water on the quay side and harbour wall. Showers. €50 per night for 12 m cat. Rubbish disposal is well out of the marina area at the far end of the large block house building over looking the marina.